Hey Electrotrash heads. 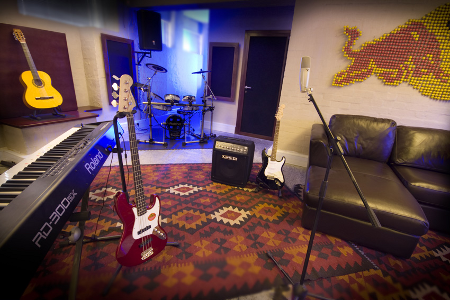 Some time back you may have read a blog post about the Red Bull Music Studios down in Cape Town. Following on from that I’d like to introduce a regular Electrotrash post to do with the RB studios. As many people would agree, Cape Town is a hub of mad electronica, being the hometown of African Dope and the mid 2000 wave of brilliant glitch-hop courtesy of the Real Estates, Waddy Jones, Considerate Builders Scheme and many more. There are a whole new wave of beat-smiths, emcees and DJs coming up the ranks and over the past months I’ve gotten into the rhythm of getting these guys into the Red Bull Studios to make music. Of course they’re all pretty amped to get stuck in, cause we have some sweet noise making artillery down here. And it doesn’t stop in Cape Town. Of course anyone familiar with this blog will know that cities like Pretoria, Joburg and Durban have their fair share of sonic-manipulating genius. We’re going to endeavour to get as many mad music makers from around the country into the studio to bring the noise. All the music coming out of the studio will be available on the exclusive Red Bull Studio blog at www.redbullstudioza.com. Of course the blog is just starting out, whereas Electrotrash is the online hub for local electronica, being around since before some of the artists on here even knew what an oscillator was. This column will be a roundup of the great electronic music coming out of the Red Bull Studios in Cape Town and wherever possible I’ll make sure to get exclusive content onto Electrotrash for all your downloading pleasure. Kicking things off is this Dubstep remix of DJ MX’s “Like I See You” featuring song bird Black Porcelain. While the original is a rolling South African house number, not really in line with Electrotrash’s vibe, the remix is a dark, asthmatic juggernaut that fits in perfectly with the meteorically rising Dubstep scene in Cape Town. Before I leave I would like to introduce one last musical innovation courtesy of the world’s biggest energy drink: Red Bull Music Academy Radio. An internet radio station, RBMA Radio has a catalogue on some of the most incredible artists making music in the world, I kid you not. As an example you can see this playlist embedded into this post below which you can actually simply play off this post. A banging electrified mix from Crookers, a one on one Dubstep session featuring Benga and Skream and a live recording of electro-pop king, M83 should be enough to make you head over to www.redbullmusicacademyradio.com to see what the deal is for yourselves. Otherwise keep an eye out on Electrotrash as well as the studio blog for more Red Bull Studio Cape Town freshness in the weeks to come.